Richard Wayne Penniman (born December 5, 1932), known by his stage name Little Richard is an American recording artist, songwriter, and musician. He is one of the early creators of rock and roll music in the 1950s. In 1951 Little Richard began his music career by making gospel and jazz influenced rhythm and blues. He did not sell many records until 1955 when he added a loud drum beat and loud Gospel-style singing and boogie-woogie piano playing. This new music would come to be known as of rock and roll. 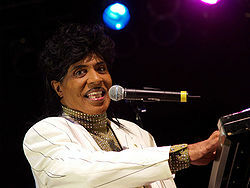 Little Richard influenced many rock and roll musicians who started after him. In 1957, when he was at his most popular point, Little Richard quit rock and roll music. He went to Bible college and became a church preacher. He then went on to play only Gospel music for many years. He returned to playing rock and roll when he was older, and also continued playing Gospel music. In 1986, Little Richard was inducted into the Rock and Roll Hall of Fame. He was one of the first seven people to be added to the museum. 12/56 "The Girl Can't Help It"
12/56 "All Around the World"
3/57 "Send Me Some Lovin'"
2/58 "Good Golly, Miss Molly"
3/59 "By the Light of the Silvery Moon"
11/62 "He Got What He Wanted"
7/64 "Bama Lama Lama Loo"
11/65 "I Don't Know What You've Got But It's Got Me"
8/66 "Poor Dog (Who Can't Wag His Own Tail)"
8/73 "In the Middle of the Night"
This page was last changed on 11 October 2018, at 06:39.